The former gas works occupied two distinct sites separated by Poplin Street. The Bartholomew Street Site occupied an area of land enclosed by Dunn Street, Dalmarnock Road, Bartholomew Street and Poplin Street. The Poplin Street Site occupied an area of land enclosed by Dora Street, Poplin Street, Sawnston Street and French Street. I&H Brown [IHB] were instructed by Clyde Gateway to undertake remediation of the two parcels of land associated with the former gas works site. IHB’s scope of works initially included the excavation, processing, bioremediation and soil washing of contaminated material which was predominantly located in the below ground gas holder bases (as infilled material). The soil washing operation was terminated towards the end of 2012 and an alternative remediation solution was sought. 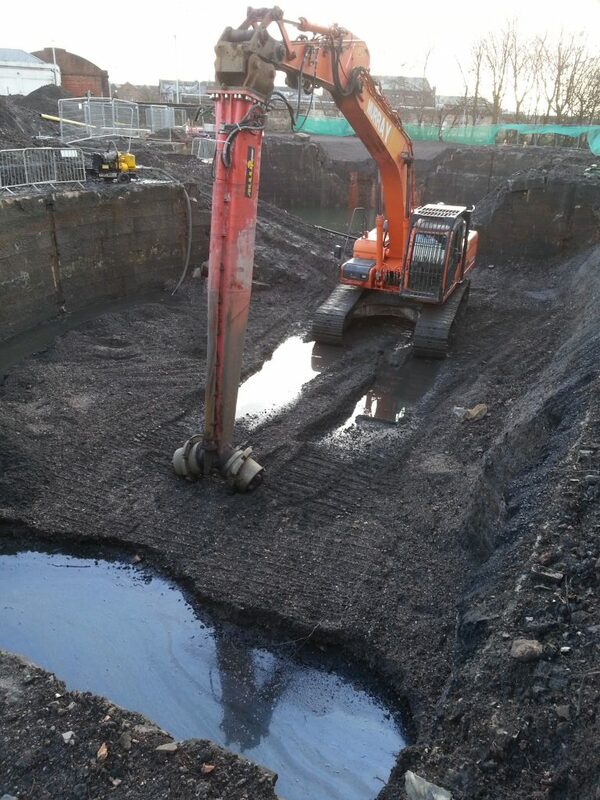 The alternative remediation solution was required to address the stockpiled filter cake material and the remaining untreated materials on both sites. The requirement was to comply with the remediation target criteria [RTC] derived by Grontmij and to remediate the contaminated materials within a very short timescale to achieve the contractual obligations. At the end of 2012 Envirotreat was invited by IHB to develop a remediation [E-Clay Stabilisation] solution based on an estimated overall treatment volume of circa 15,000m3 . Envirotreat was subsequently engaged by IHB in early 2013 to achieve the remediation objectives within a very short timescale of 2 – 3 months. The majority of the contaminated soils (13,680m3) were treated ex-situ employing a remediation strategy developed through laboratory based treatability trials to determine the most effective E-Clay Stabilisation medium. The treatment process was further refined onsite to reflect the variable nature of the respective waste streams. It was not feasible to excavate contaminated materials from Gas Holder A8 (as the gas holder was partially located under the adjoining roadway and there was a potential risk of structural collapse if the material was excavated). As a consequence it was decided to implement an in-situ remediation approach treating the contaminated gas works material ‘in-place’. The in-situ treatment (1,340m3) was carried out utilising an Allu soil cutter / mixer to achieve effective in place mixing of the treatment reagents with the gas holder materials.